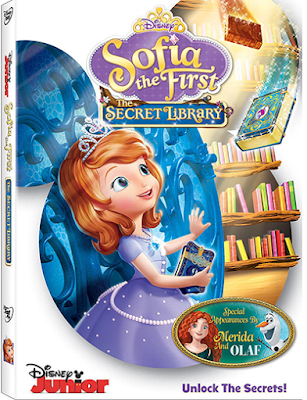 My daughter was so excited when she saw we got the DVD of Sofia the First: The Secret Library. When I say excited, I do mean it. It’s her favorite show right now. She can watch the same episodes over and over again and never get tired of them. Sofia the First: The Secret Library is now available for you to buy. Not only does it have some of the best episodes but it also has Merida from “Brave” and also one of our favorite characters from “Frozen”, Olaf! To make it even better, the DVD also comes with a Sofia Necklace. Sofia's Aunt Tilly returns to give her a gift that will unlock a secret world and appoint Sofia storykeeper of magical books without endings in "Sofia the First: The Secret Library." Follow along as Sofia pursues adventures that will finish the narratives, including rescuing Minimus' brother from an evil prince and setting out on a mission to stop Miss Nettle from stealing all the beautiful snowdrop flowers from the wintery kingdom of Freezenberg. Merida from Disney•Pixar's "Brave" and Olaf from Disney's "Frozen" make special appearances. I recommend if your child is a Sofia fan that you get this. Like I said, my daughter loved it. It’s pretty much on a loop. It’s so cute, that I really don’t mind.